In her new book, Riding With the Ghost, writer Erin Osmon accomplishes a tricky feat regarding the late Jason Molina, the songwriter and leader of Songs: Ohia and Magnolia Electric Co. She presents Molina, whose work can so often mythic, as if carved from ancient stone, fully as a person, with faults, desires, humors, and failings. She doesn’t strip his songs of their mystery or allure, but rather illustrates the idiosyncratic and personal details that led to his remarkable words and melodies. In doing so, she gives us the gift of more fully knowing Molina, as well as his companions and friends, those who traveled alongside him through life. 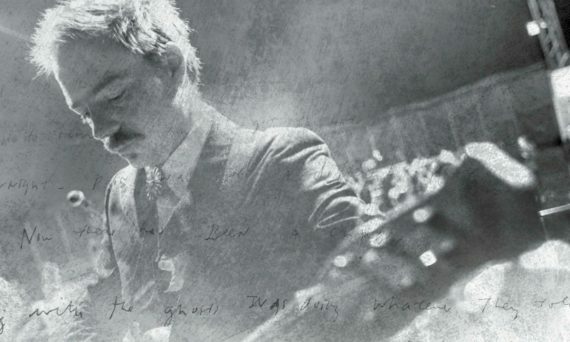 She did learn more, becoming a fan and following as Molina pivoted from Songs: Ohia to Magnolia Electric Co., his writing developing with each subsequent album. Following Molina’s tragic death from liver failure in 2013, Osmon was compelled to know more about his life, to uncover the stories and events that made him. “I wanted to know the whole story,” Osmon says. She endeavored to find it. Through extensive interviews with Molina’s loved ones and fellow musicians, she sketches a view of a man whose odd humor was matched by creative sensitivity, and whose fascination with Civil War lore and the supernatural commingled to create the foundations the body of work that blended blues, gospel, country, folk, and hard rock. Like other great American lyricists — think Bob Dylan or Robert Hunter — Molina wasn’t keen on explaining himself or unraveling the way his personal myth-making played into his songs. But Osmon sorts through his words, from his early lo-fi days to what the team at his label thought was his “crowning achievement,” Magnolia Electric Co.’s Josephine, and tugs at the threads that connect the songs to the man. Like any good biography, Osmon illustrates the events of Molina’s life by keying in on the intimate details that made the man. Simple little facts, like his lifelong taste for pizza, fried chicken, BBQ, and pumpkins pie, make him feel closer. She examines the relationships and loves which infused his songs with passion, speaking at length with his wife, Darcie Schoenman. Tracing his movements from a small trailer park in Lorain, Ohio, to Oberlin College, where he began recording as “Sparky,” through the midwestern indie rock scene of the ’90s and 2000s, Osmon puts the music of Songs: Ohio and Magnolia Electric Co. into cultural context, and examines the relationship between Molina’s art and sadness. Writing about the alcoholism that ultimately claimed Molina’s life, Osmon’s words are straightforward. Detailing tragedy without slipping into aggrandized “tortured genius” tropes can be difficult, but the author presents the details and relies on the words of Molina’s closest friends, those who valiantly struggled to help save him, to convey the loss. This month, Osmon joins original Magnolia Electric Co. members Mike Brenner, Jason Evans Groth, Mikey Kapinus, Mark Rice, and Peter Schreiner, along with Joe O’Connell of Elephant Micah, on a tour in support of the book, with Molina’s songs to be played each night. Ultimately, Riding With The Ghost winds up being a celebration of not only Molina and the lingering power of his songs, but also the community that gathered around him: his steadfast champions at longtime label Secretly Canadian, his family, many friends, and his bandmates.